Deborah Heng is Senior Vice President and Country Manager, Singapore for Mastercard, a technology company in the global payments business. As Senior Vice President and Country Manager, Ms. Heng leads all aspects of Mastercard business expansion efforts in Singapore, working with banks, non-financial institutions and key merchants to drive business results. She also oversees the rollout of the next generation of payment products and solutions in Singapore as Mastercard continues to innovate for digital convergence. Prior to her current appointment, she was Division Finance Officer for Mastercard in South East Asia and South Asia. In her 18 years with Mastercard, Ms. Heng has been instrumental in providing strategic business insights to achieve profitable growth for Mastercard. 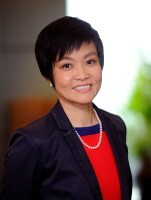 She has overseen diverse and major business deals, delivering against aggressive revenue targets and managing investment budgets across varied geographies - first in the Asia Pacific region, followed by Europe, after which she moved to roles in Customer Relationship Management and Business Development based in Singapore. Ms. Heng began her career in public accounting with Deloitte & Touche and has since charted a distinguished career in finance, working across all aspects of the function from regional controllership, strategy planning to business development. Ms Heng also brings valuable experience from the hospitality industry, Shangri-La, Conrad and Hilton, where she was responsible for the overall hotel financial operations and performance. Ms. Heng holds a Bachelor of Accountancy degree from the National University of Singapore and a Master of Business Administration degree from the University of Nottingham, UK.